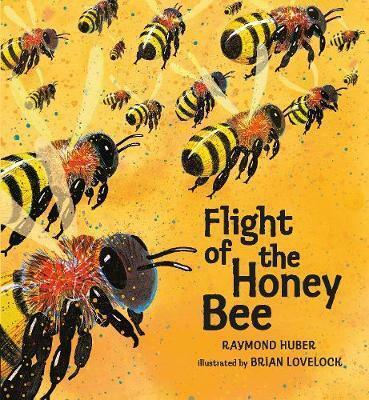 Follow the flight of a honeybee as it searches for nectar to sustain its hive and, along the way, pollinates flowers to produce seeds and fruits. A tiny honeybee emerges from the hive for the first time. Using sunlight, landmarks, and scents to remember the path, she flies in search of pollen and nectar to share with the thousands of other bees in her hive. She uses her powerful sense of smell to locate the flowers that sustain her, avoids birds that might eat her, and returns home to share her finds with her many sisters. Nature lovers and scientists-to-be are invited to explore the fascinating life of a honeybee, gleaning golden tidbits of knowledge to pollinate their young minds. Raymond Huber has been a social worker, gardener, primary school teacher, lecturer, writer and editor. He lives in New Zealand. Visit his website at www.raymondhuber.co.nz. Brian Lovelock is the illustrator of Roadworks, Demolition and Construction by Sally Sutton as well as The Rain Train by Elena de Roo and Did My Mother Do That? by Sharon Holt. A geophysicist and fine artist, Brian Lovelock lives in New Zealand.